'Lights On' warning buzzer, BMW emergency call, BMW Teleservices, Brake force display, Engine start/stop button, Oil level indicator, On board computer, On board diagnostics, Outside temperature display, Service interval indicator, Speed limiter, ABS/EBD, Automatic Stability Control (ASC), CBC - (Cornering brake control), Child locks on rear doors, Crash sensor, Driver/Passenger airbags (Impact dependent), Drivers knee airbag, DSC+, Dynamic brake control, Dynamic Traction Control - DTC, Front side airbags, Hill start assist, ITS head airbags for front/rear, Pyrotechnically pre-tensioned front seatbelts, Seat belt force limiter, Three 3 point rear seatbelts, Tyre pressure monitor, Warning triangle and first aid kit, Electronic immobiliser, Remote central locking, Thatcham Cat.1 alarm, Auxiliary point for auxiliary devices, BMW professional radio with CD player, Digital Audio Broadcast (DAB) Tuner, 12V power socket in centre console, 12V power socket in passenger footwell, 2 cupholders, 4 grab handles, 60/40 split rear seats, Anthracite Velour floor mats, Door armrests, Door sill finishers with illuminated M designation, Driver/passenger sunvisors with ticket holders, Dual zone automatic air conditioning, Folding rear seat head rests, Front door storage bins, Front folding/sliding centre armrest with storage, Front head restraints, Front isofix attachment + airbag deactivation, Front sports seats with electric side bolster adjustment, Front/rear courtesy lights with soft on/off dimming, Glovebox, Individual anthracite headlining, Isofix rear child seat preparation, Leather gear knob and handbrake grip, Load restraint lashing eyes, Luggage compartment lighting, M sports leather steering wheel, Multifunction steering wheel with audio controls, Reach + rake adjustable steering column, Storage compartments in front/rear door panels, Vanity mirrors, Welcome lighting, Body coloured bumpers, Body coloured door handles, Body coloured door mirrors, Chrome exhaust tailpipe, Chrome kidney grille with black vertical slats, Electric front windows + one touch + anti-pinch, Electric rear windows, Electrically adjustable door mirrors, Follow me home headlights, Front fog lights, Green tinted heat insulating glass, Heated door mirrors, Heated windscreen washer jets, High gloss shadow line, M aerodynamic bodystyling, Rain sensor including auto headlights activation, Rear wash/wipe, 18' light alloy wheels - M Star spoke style 386M, Run flat tyres, Diesel particulate filter. 5 seats, BLUETOOTH + AUX + USB + ALCANTARA INTERIOR + REAR PARK ASSIST + CONNECTED DRIVE + BMW SERVICE HISTORY + 2 X KEYS. 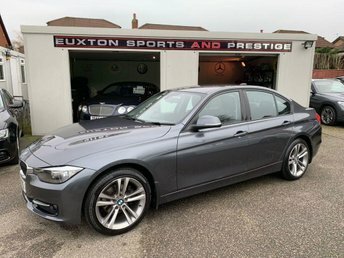 , BLUETOOTH + AUX + USB + ALCANTARA INTERIOR + REAR PARK ASSIST + CONNECTED DRIVE + BMW SERVICE HISTORY + 2 X KEYS.